Do you own a bunny? Do you care about his/her well-being? Teeth disorders in bunnies are not rare health issue. Learn more about what are the early signs of teeth disorders in bunnies, and how to treat them. Prevention is key! There are two groups of teeth inside your bunny's mouth. Front teeth are called incisors. They are four teeth right in the front of the jaws (two in the upper jaw-maxilla, and two in the lower jaw-mandible). Bunnies use incisors to cut their food into small pieces, so the food can be processed by the teeth in the back of the jaws (molars). Basically, molars are grinding teeth. They can be hard to see. That means, their inspection is a bit more difficult. I will write about teeth inspection later. Now that you know the basics about what kind of teeth bunnies have, I will now teach you something else. It is important to remember that bunny's teeth grow continuously. Yes, you heard right: they continue to grow throughout the whole life of your bunny. Well, in order to keep their teeth at a constant length, your have to provide various things for them to chew. Giving them hay, vegetables and other fiber rich food is a good way to prevent teeth overgrowth. But they have a constant need to chew things. In order to keep their teeth away from your carpet or other pieces of furniture, you will have to provide chewing toys for them. To find more about good and bad food and toys for your bunnies, find more info on Living with a Bunny. The most common teeth disorder is malocclusion. This is a condition where upper and lower teeth don't meet well. It is either that upper teeth are moved slightly to the front or to the back in comparison to the lower teeth. This disorder can be inherited, or it can be caused by some trauma (hitting the ground with their jaw when landing- bunnies can jump high, but landing is something they can't perform in the best way. Every now and then, when jumping off the chair, they will land in the wrong way). Doing this, they can hit the ground with their teeth and hurt them and make them grow in a different direction. If not meeting well, teeth wearing is being compromised. This means they will continue to grow. Bunny's teeth can grow to the length of few centimeters. They can grow outside the mouth or even inside the mouth, growing into the gums and tongue that way. All this is painful, and prevents your bunny from eating. Teeth root extension farther into the jaw. Molar Spurs Is a Teeth Disorder Connected to Molar Malocclusion. If complementary molars don't align to each other well, their edges will continue to grow, due to bad wearing. In the case of upper molars growing toward the tongue, their inner edges will continue to grow. In same examples, the outer edges of lower molars will be the ones that grow and form spurs! Spurs are spikes, or extensions of molars. They tend to grow into gums, or even the tongue. This is painful for your bunny. In extreme conditions, spurs can form arches over the tongue, preventing your bunny from moving his tongue. Living With a Bunny: Bunny Teeth Care - Gum And Teeth Root Infection. The most common reason of teeth root infection in bunnies is often teeth trimming. Especially if inappropriate tools are used. Many veterinarians, or even bunny owners tend to deal with teeth overgrowth by trimming bunny's teeth. This is one of the solutions to the problem. But it is not going to last for long. Bunny teeth trimming must be done every two to four weeks. Using wrong trimmers, or doing it in a wrong way, or just doing it for long time, will cause small fractures into the teeth. If fractures go under the gums, they can open the way for bacteria to spread into the gums, and to the root. This is painful. More about treatment, prevention and teeth examination, see under Bunny Teeth Care: Prevention. This disorder occurs in elderly rabbits. When this happens, there is danger of teeth root starting to grow farther into the mandible/maxilla. The root can penetrate the sinus or eye orbit, bringing bacteria in these areas. It is followed by pain, and inflammation. What do you think of having bunny as a pet? Bunnies are great! They are so cute! I would like to have one! Oh, I already have a bunny! We spend great time together! Emmm, no! I am not small mammals lover! I love bunnies, but only in photos! What is the most important thing about prevention of teeth disorders in bunnies ? Teeth examination is key to prevent bunny getting hurt by his own teeth. Don't be afraid to check his teeth and see if there is malocclusion. Check if teeth are overgrown. Checking incisors: hold your bunny tightly. Keep his legs immobilized. Just pull his lips apart in order to see his incisors. If they don't meet each other, keep an eye on them. If they are overgrown, take your bunny to a veterinarian (don't try to do trimming by yourself). Checking molars (grinding teeth): this is a bit though to do. We don't have instruments to do this. Look for secondary signs of molar disorder: swelling, loud grinding, drooling, sudden reaction when you try to palpate bunny's cheek. What is important? What should you be doing from the very first day of owning your bunny? Give your bunny fiber rich foods to eat (hay, green vegetables)! Provide some chewing toys for your bunny (see link below)! Visit a veterinarian every now and then! Mal-occluded teeth are not of any use for your bunny. In earlier years, veterinarians used to trim teeth every two to four weeks. I have explained that this can lead to root infections and other complications (such as root fractures). This, and the stress for your bunny, caused veterinarians to revise their methods. Now it has been accepted that pulling out teeth in cases of malocclusion is the best solution. This is a permanent solution of the problem. Mild anesthetic is used for this surgical procedure. Ten days of antibiotic therapy is required. After this procedure, your bunny needs four to twelve hours to be able to eat again. If he's lost his incisors, you will have to cut the hay into small pieces for him (two to three inches long). Find more information on Bunnies as Pets! Very interesting info on bunnies teeth care. I have friends who had bunnies (yes, plural) and they never mentioned how they take care of their teeth. But I remember they surprised me with stories about constant fights especially among young males. I had no idea so cute animal can be so aggressive. I am personally more a bird person, but I think after birds rodents will be in close second position (before cats or dogs for sure). I am so sorry to hear that. It is huge loss when you love an animal, but you are not able to have one. As you said, luckily you are not allergic to dogs. Thank you for your kind comment! Great deal of useful info here in this Wizz which will help bunny owners. 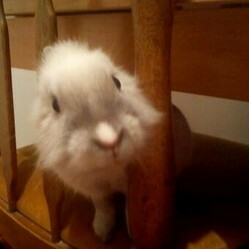 I am glad to hear from you about your bunny experience. I have raised dozens of bunnies over the last ten years. They make great pets and have a lot of personality and are even great house pets. Its important to know about common health issues though. I think teeth issues, diet and summer heat are the main ones to know about and 2 of 3 are covered here! Great article! I had some angora bunnies. It would be nice to have another one. They do make good pets. Very helpful article on bunnies, I did not know you had to care for bunnies teeth as you do. My daughter would love a bunny as her friend has one who is so sweet. It once got a hair ball that had to be surgically removed, that scared me. Thanks for the tips on bunny rabbit care. Great article with lots of great information. I used to have bunnies and I loved them. They got along with the cats and the dog inside the house. In fact the bunnies used to chase the cats around the house andit was fun to watch. They played together many times. They are easy to little box train too.